Where Are the Crochet Bloggers? Since the earliest days of CrochetMe.com, I’ve wondered where the crochet blogs are. 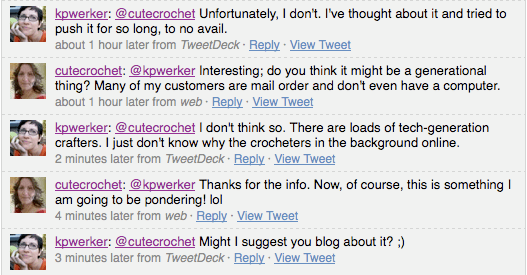 I don’t mean to imply that there aren’t many crocheters online; of course there are. For this post, I’m focusing entirely on blogging and tweeting; forum participation is a different breed of online activity (ask me why). But, compared to blogs from other types of crafters—and yes, the sewing- and knit-blog communities are at the top of my mind—there just aren’t that many. The explosion of crochet blogs I anticipated five years ago hasn’t manifested. That’s disappointing. A large, thriving community of crochet bloggers would not only make hordes of people happy, it would also provide a fertile ground for experimentation and collaboration. These things are the foundation of the evolution of the craft. This morning I had the first spark of an idea, though. I had a lengthy (well, for Twitter it was lengthy and please pardon my typo) conversation with designer Jocelyn Sass, who asked me if I have a theory about why there aren’t very many crocheters blogging and tweeting. We discussed further, and during our exchange she mentioned keeping her tweets and blog posts mostly related to crochet. That’s when the switch clicked. It’s a rare blogger—on any topic—who can remain entirely on topic all the time and still be engaging, still inspire readers to care about what they have to say. They have to be a wizard with words, they have to absolutely kill with high-quality information, they have to post the most beautiful photographs around. The rest of us—well, the rest of us have to bring in other topics to keep things interesting. We have to relate our craft to our everyday lives, we have to go off on entertaining tangents, we have to write about major events going on around us, our work, art, other crafts. What might be considered irrelevant tangents to the most narrowly focused crochet blogger are actually the ingredients that make many blogs worth reading. I didn’t say it before, but I will say it now: Of the relatively few crochet blogs that are out there, a vast number of them are boring. They’re the blog equivalents of Bubba listing all those kinds of shrimp. Kids, that’s just not interesting. And so here’s my first theory in five years about why there aren’t very many crochet bloggers: If there were more riveting crochet blogs, more crocheters would blog. More people would want to participate in the conversation. More people would be inspired to share their own stories. What makes a blog interesting? Getting to know what makes the blogger tick; seeing the amazing products of their imagination; learning new techniques or tips; being entertained; being inspired. Sometimes I want to shout to the world, “Would you please be more interesting? !” I could make a top-ten list. Blog for you. Write the things you need to say. Your readers are people, and likely crafters just like you. Make them think, and make them feel. Blogging is about conversation. Converse. Have an opinion. Share it. Don’t apologize for it. Read blogs that aren’t just about crochet. Read the news. Talk to people. Listen to music. See movies. Watch television. Understand that doing all of these things informs what you do with your hands. Let that come out when you write about your craft. Stop! Do not post another blurry photograph on your blog. Take another picture. Turn off the flash and use natural light. Rinse. Repeat. Use spell check. Seriously. It prevents you from undermining your own credibility. Punctuate. Seriously. Punctuation is what makes written works understandable. To be interesting, you must be understood. What do you think? Do you read boring blogs because you feel you have to? What interests you? What do you do with your own blog to keep things interesting for yourself and for your readers? I would love to see more crochet blogs! I unfortunately do not have my finger on the pulse of the industry, but would definitely read those who do. I also like to hear about design processes and that sort of thing as well. I am woefully undermotivated when it comes to blogging myself, though, and I'm not sure why. I suppose part of it is that I don't take the time to sit down and DO it. I knit and crochet and I blog. Most likely, my problem is that I don't blog often enough since I tweet, plurk, and facebook too. Still, I decided long ago to just simply love my crochet–not to apologize for it or go into any knit of “knit vs crochet” stuff. I do good work that pleases me and others and that's all I need. motivation is that? ), it's about what you blog and what you get out of it. My blog is mostly about crochet and what happens in the crochet world. I try to keep a regular pace at blogging and also not talk about crochet on an other media such as FB. I try to give my readers something to think about and often ask them what's their opinion. I also try to share a lot on what I'm crocheting (work in progress, tutorials, …) But that's difficult. I mean, I havn't got enough time nor space in my publication agenda to write about everything I'd like. Plus, my readers have developped an habit of commenting with great insight and point of views (which I am happy about) and that pushes me to keep up the level which requires a lot of work . Don't get me wrong, I LOVE blogging, all I'm saying is that getting people interested in a crochet blog is a LOT of work. Yes, it sure is a lot of work. It sounds like you get a lot out of it, too. Well, my first thought was “oh my god, she thinks my blog is boring!”. I really just blog what I want to share and what I would want to see, I am not trying too hard to be interesting. Maybe I should? I don't know. My blog ist not a hundred percent crochet, but I try to keep it craft related. As for twitter and Facebook, I am still not on either, but I am starting to feel left out. But I have no idea how and when I could handle another couple of sites to keep up with and update. I don't know how you do it. reach as many people as possible. being stressed out about my involvement online. It took years. I can't speak to other people's choices. My blog is about what I happen to be doing that I want to share, whether it's crocheting, knitting, sewing, baking, sorting shell midden, or admiring my dogs. I'd say I'm unlikely to try to turn my blog into a fabulous, crochet-focused blog mainly because I'm not really that into blogging, honestly. I've been doing it for years but I get much more interaction and feedback on forums and social networking sites. I've even been considering dropping the blog in favor of directing that time and energy towards getting more design work done. Blogging recently is a chore – designs I can't talk about let alone show, industry things I pull back on lest the blog read like a commercial for all my new work, family stuff that I don't post lest it intrudes on someone's privacy. Doesn't leave me a lot of subjects. Now the podcast I love – and I figure if people really want to know what I think they can tune in there, since I do a new one every week. I would love to be part of a community of crochet blogs. While my craft interests are more diverse than just crochet, it is the one I do the most. Just today I was talking to my fiance and trying to figure out exactly what it is I do with my evenings when I'm not rehearsing for a play, and the verdict came down internet and crochet. I have trouble sustaining my own interest in my blog (evident, as my last post is from January, and my average posting rate is probably about once every two months). It's not that I don't love to crochet and to read about crochet – those are two of my favorite things – or that I don't want to write about it. I just don't know what to say. The operetta I'm in is consuming my life right now but I hope in April to re-commit to kibathediva.net and make it a blog worth following. (I have multiple blogs, and March is the month I'm spending recommitting to my reading one, though it hasn't been as strong a commitment as I hoped because again, operetta.) I have lots of inspiration and am getting more all the time. I have designed a whole two things ever, which I think is part of why I struggle to feel like I have something valuable to say. I do love to read your blog, as well as Robyn's, Vashti's, and Doris's. I am interested in lots of crafts, so read a range of craft-related blogs – sewing (clothes, bags), quilting, crochet. I blog myself too, but because my interests are broad, the content of my blog is too. I started to blog as a form of “show and tell”, and that is mostly how it has stayed. I'm not a designer or particularly creative person, but I do love to crochet, so there is always quite a lot of it on my blog. One of my favourite crochet blogs is Attic24 – evocative writing combined with glorious colour – but if I'm looking for crochet inspiration I spend more time on Ravelry than on blogs. It all depends on why people are blogging I think – and on how much available time they have to be online! Sorry if this is a bit incoherent – typing with toddler on my lap. I blog at least 5 days a week. I crochet and knit and blog about both often. I also blog about art, architecture and interesting things going on in the Los Angeles area. I try to read as many crochet and knit blogs as possible. I agree with you about photos!!!! Take that item OUTDOORS and take as many shots as you need to get a decent one. Cropping your photo works wonders too! I blog but am kinda new at it. Sometimes it's yarn related, sometimes not. Just depends on what bubbles in my brain. Why do you figure forum participation is a different breed of online activity? It's looking like you're right but why? I particularly agree with #6 and #10 on your list, about applying your own varied experiences & life stories into what you write and crochet. Interested people are interesting. As someone new to both crochet and blogging, the audience I aim to attract is the person who was like me a year ago: someone not interested in crochet or crochet blogs. However, crochet blogs like the ones I will list below were successful at transforming me into crochet blog reader and, eventually, a person who crochets amigurumi and blogs. Vashti, I understand how you feel about balancing professionalism with the desire to maintain an open and creatively honest blog. One of the things I struggle with most is maintaining the energy of inquisitive inspiration that my blog began with. When I was a new designer, I was constantly figuring things out and writing about them. Now that I'm a bit more seasoned, I'm still creatively stimulated in my work, but I'm not necessarily problem-solving as much, but I'd still like to have that spirit in my blog. Regarding comments, I'm not sure why some blogs get millions of comments and others don't. Like you, I no longer worry about that because know my readership is there. Also, I feel privileged that my commenters are thoughtful and insightful when they do leave messages. the roles I'd assumed I needed to play. So in the fall I gave it up. which posts on other blogs inspire me to comment. before. It's great food for thought. I'm excited to see what you're getting up to! Ok I hardly ever crochet so that rukes me out as a crochet blogger, but…just wanted to say what an excellent list. Especially number 5. And, of course, number seven. them with blogs and Twitter. can hear from you specifically. I've either lost it or hadn't actually thought it through fully. I've blogged about crochet but the word that drew readers in was “scrumbling”. You should see how many hits I've received from the US, Australia and NZ when scrumbling has been a topic. I'm sure there have been a few hits due to mentioning Prudence Mapstone and Sylvia Cosh, but scrumbling is something people are eager to read about. I guess that means, when you post, just toss in a scrumble or scrumbling here and there and watch your comments and hit build! Whooo Hooo! Scrumble, scrumble, scrumble….. I HOPE I have an interesting crochet blog! LOL!! I try to talk about crochet related items mostly, but I do add in personal info too. I think my readers like to know a little more about the designer, even if I am new to the designing world. I also use it as a promotional tool since most of my patterns are self-published and I like to make sales, LOL!! I am going to try and be a better crochet blogger! Blogging can be such a mirror because I'm an avid reader of them, so I watch myself as a reader/commenter. Like you, there are many where I don't spontaneously comment either, yet enjoy what I read. Sometimes I stop at a blog on my way to somewhere else and am too preoccupied to notice that I have a reaction to what I've read. Other times I'm just sated and there's nothing to say. I do comment more when I decide that I'm going to, and I've made great new connections with people because of it. A flip side is responding to comments on one's own blog. I stopped doing that early on–the blog architecture didn't really support a 2-sided conversation feeling–but things have improved there. Yes–I think your emphasis on the differing responsibilities is key. Twitter is very stats-based among many users (how many follow, the ratio of following to follow, proportion of @ replies to not, etc) which amps up the sense of responsibility for the conversations one starts. In a forum, the moderator/listmom feels a kind of responsibility that no other member of it does. I can't say strongly enough how much using Disqus has helped to improve conversation on this blog — not only because I can easily reply publicly to comments if I want to, but because *all* commenters can participate easily in actual back-and-forth conversation here. Hope I'm not too late chiming in here. Personally, I don't have enough time to read blogs, though when I do I find them interesting. When I decided to go on line, I went for the ezine idea, hence Crochet Insider. Sometimes I wonder, though, if I should have a blog instead, or as well? I mean, I get lots and lots of readers, so does it matter? What I really want to do is help change the crochet world, but not sure of the best way. Thank you for this post, and for all these great comments! Reading all this has really inspired me to pay more attention to the quality of words, etc that are posted in my blog. I too have often been torn between being professional and expressing myself fully. I almost feel obligated to keep it professional because of my relationship with a certain yarn company… like what I put forward as my personal opinions could reflect how people view this company. It's been requested, that I not rant and rave about yarns from other companies, despite how much I really love the yarn. When I'm wrapped up in things that don't involve this yarn company, sometimes I just don't post at all. I'd rather just not post than say things that are restricting the way I really feel. Anyway, that's frustrating… but I'm inspired now to be more creative with what I post about. It doesn't always have to be about the yarn! Thanks everyone. I guess I'm trying to figure out what exactly one means by an “interesting crochet blog.” Are we looking for a crochet tech blog? A crochet photo blog? Something akin to Yarn Harlot, but focused on crochet? A blog about designing? And also, what makes a crochet blog? I'll be honest, I always wondered why crochet didn't have a Stephanie Pearl-McPhee or an Elizabeth Zimmerman. Is it because we tend to keep it all in the family? Is it because there aren't really that many of us? Is it because of a residual stigma? Or is it more that we might not need it? I've always held EZ as more of a teacher, and I wonder if there is as definite a role for a iconic teacher in crochet. I do think there's a place ready for a crocheter to become a sort of SPM for crochet, but you need someone willing to be that open, that intimate, and that familiar with a crew of strangers, and then those strangers have to find him or her. Or maybe, what is a cool knitting blog? It might be that I don't know what I'm missing because I don't know what others have. What inspires you subscribe to a blog? See, I don't really subscribe to blogs. I poke around and my taste in blogs changes. Right now, I love reading the comic bits. A couple of months ago, I was back to the book blogs that were brutally honest and never apologized. Before that I was into the craft blogs with beautiful pictures (and Alicia Paulson's because of her food pictures). I have a blog for a long-lost reason. Back when I had a LJ account, it was to be able to say the brutally honest things I couldn't say out loud, but then when people found me, I self-censored. And now, I self-censor because I have a life outside of what I put on my blog that needs to be tended and protected. I can't be brutally honest anymore because employers look at Facebook and MySpace accounts and blogs. I'm okay with the self-censoring because it helps one know reasonable boundaries, but I wonder how interesting a blog can be if there are these recognized boundaries. Most interesting thread since the one on Sarah Palin, Kim! Seriously! I don't blog often enough. This is particularly true in winter, since I believe that a good post on my blog must have a nice photo, and the light is so crappy here in the winter. That being said, I think that my best blog posts have nothing to do with the photos. They come when I stop thinking about what I should write, and just sit down and, well, write. I think it's very interesting to see how new social media, like community sites, Twitter etc. affect blogging. Personally, I can't keep up with it all, but I've noticed a new focus on blogs in my own case. And definitely more quality than quantity – I follow just a few blogs regularly, but I read them all the time. A very good blog is about a million times as interesting as any forum on the Internet, IMHO. write, I do my best work. Also is there a list of twitters who tweet about crochet? I am fishcube on twitter! sorry forgot to add my webpage to my profile. There are several interesting topics here. Thanks for hosting the discussion. I'm posting sort of as an outsider as I have never blogged about crochet… I don't blog much about knitting anymore either though! But I'm thinking about blogging in general… is it still as vital as it was now that there's twitter and facebook and ravelry and various other fora for discussion? Maybe it's just too diffuse? I do remember way back when in 2002 when I started knitblogging, there was a webring and the membership was small enough you could really surf the whole ring on a good day. There was such a sense of community to it! I remember feeling compelled to keep up with it, seeing what everyone was doing and doing my part to comment and keep the conversations going and i think that feeling was very much shared at the time. I think people discovered it and really did sense that there was a community and wanted it, wanted to be part of it. And that's what caused the explosion in the number of knitblogs. Sure there was great content, but I think the sense of community and discovery of like-minded souls was really the driver. Knowing that people I admired and was learning from would be reading me too inspired me both to blog and to be creative in very powerful ways. Maybe the fact that there are relatively few crochet blogs makes the potential for community building at this moment stronger? It is very rare to find a crochet only dedicated blog – there are a few and they are very good but mostly I get my crochet blog kick from reading a selection of craft blogs that also do the occasional crochet post. Crochet still isn't as big as knitting and perhaps it never will be, because of this there just isn't the volume of patterns, books and events for the avid crocheter to blog about. I love crochet – it's definitely my number one thing to do when I have a rare spare minute, but when I decided to join the blogging community I did it as a crafter and not solely as a crocheter. Why? Well maybe because crochet fills the gaps so nicely, quick easy projects that can be done to embellish and add interest to other crafts. I didn't want to limit myself to just crochet and in a way that gives me the chance to experiment more and feed that back into the crochet I do. Oops! I'm moving my blog to http://www.mkcarroll.com; everything *should* be there now. Back in February I wrote a long post about crochet symbolcraft and how I'm trying to bring a more user-friendly charting into my self-published patterns, and I got exactly zero comments and emails regarding it. It was kind of the last straw for me. If I really want traffic, I should post more free patterns. If I really want comments, I should post more photos of my dogs. *shrug* As I said earlier, with the other networking options out there, blogging may be something I choose to stop doing in favor of other activities. You can find my combo blog (knit and crochet), A Good Yarn, here. I'm part of the Crochet Liberation Front Blogring, as well. BTW, I found your blog when I was writing my review of the latest issue of Interweave Crochet and looking for a suitable link for your name. (Sorry to see you leave IC, but I'm looking forward to seeing what Marcy does with the publication.) I love your “Top Ten” list up there, and will do my best to incorporate each of those suggestions into future blog entries. Great post – and the comments make a fascinating read too! When I started crocheting more about a year ago, I looked around for crochet blogs and was disappointed not to find anything much. I've been blogging as a stitcher for almost 3 years and we have a wonderful community of stitching bloggers. Bloggers need to blog about what they find interesting and inspirational as it all feeds in to what and how we make things whether crochet or otherwise. And the internet is such a wonderful resource for this kind of thing.